Hundreds of thousands of people in east Africa have been displaced and hundreds have died as a result of torrential rains which ended a drought but saturated soils and engorged rivers, resulting in extreme flooding in 2018. This post will explore these events using the R package smapr, which provides access to global satellite-derived soil moisture data collected by the NASA Soil Moisture Active-Passive (SMAP) mission and abstracts away some of the complexity associated with finding, acquiring, and working with the HDF5 files that contain the observations (shout out to Laura DeCicco and Marco Sciaini for reviewing smapr, and Noam Ross for editing in the rOpenSci onboarding process). We will focus on Somalia and Kenya, two of the hardest hit countries. We’ll also lean on another rOpenSci package, rnoaa, to link precipitation to soil moisture. 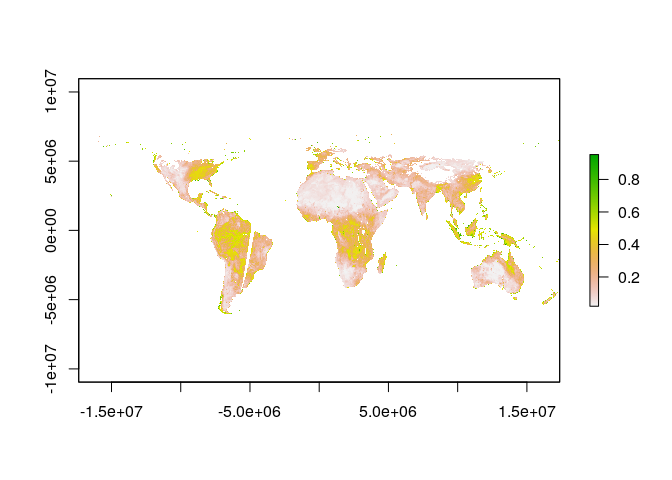 Next, we can use the find_smap function to find global soil moisture data for any day. The SMAP satellite was launched in 2015 with two sensors: an active microwave sensor and a passive radiometer. The active sensor has since failed, so we will use the radiometer data, specifically version five of the ‘SPL3SMP’ data product (for a full list of data products see https://smap.jpl.nasa.gov/data/). Notice that spatial coverage is still not 100%. Notably, places where the satellite missed and frozen regions in the arctic have NA values. We can better interpret soil moisture if we know about precipitation, and the NOAA Climate Prediction Center (CPC) has global precipitation data that are a cinch to get with the cpc_prcp function. Now we have one data frame, and we can compute a mean over all dates for each grid cell using a group_by, summarize operation. 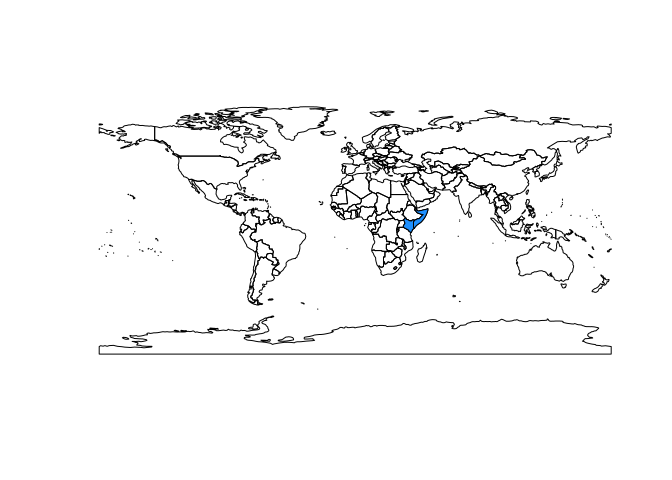 One last little detail: the longitude values range from 0 to 360, but it’s going to be easier later if they range from -180 to 180, so we’ll use mutate to get longitude defined over (-180, 180). 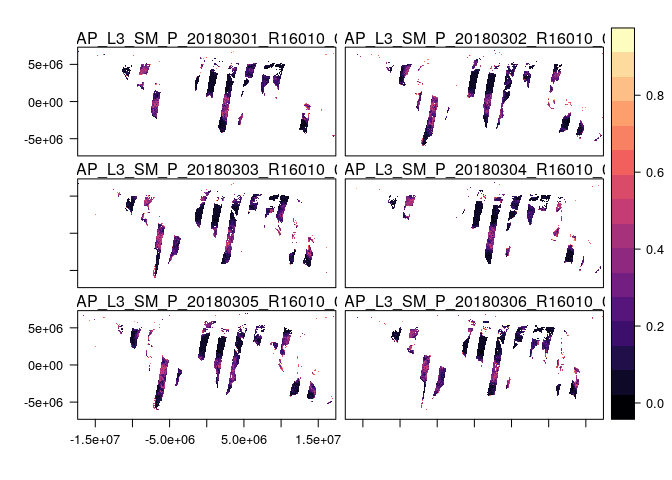 Now we have two functions average_smap and average_precip that we can use to get global soil moisture and precipitation data for any date range. Next, we’ll use these functions to get data at weekly intervals from the beginning of the SMAP data archive in 2015 through the end of August 2018. 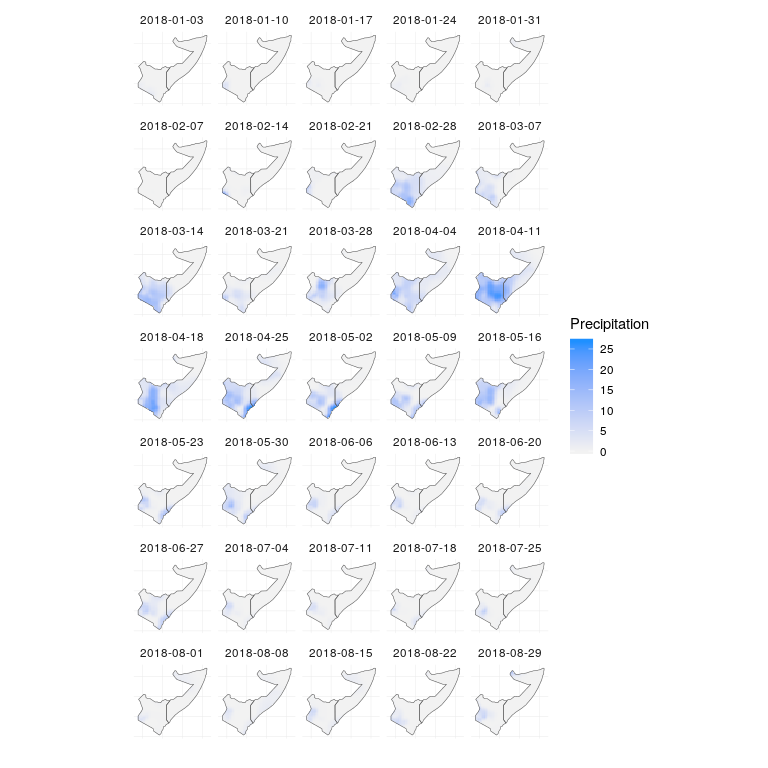 Now we have two lists, weekly_smap and weekly_precip, where each element is a raster. We’d like to convert these to RasterStack objects, and get them on the same spatial grid, in the same projection as our study area polygon. Now that we have RasterStack objects, we will create tidy data frames that we can use in ggplot2. Because the code to do this is the same for both objects, I’ll write a little helper function. 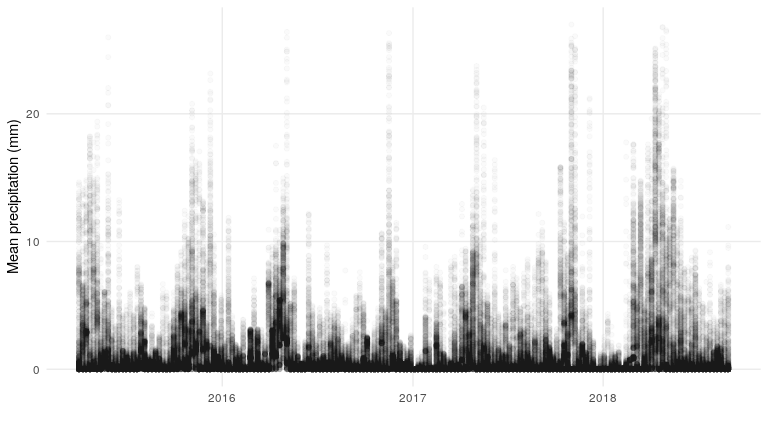 So we have a data frame where each row is a pixel with a date corresponding to the first day of the week, and then the mean soil moisture for that week in the sm column. 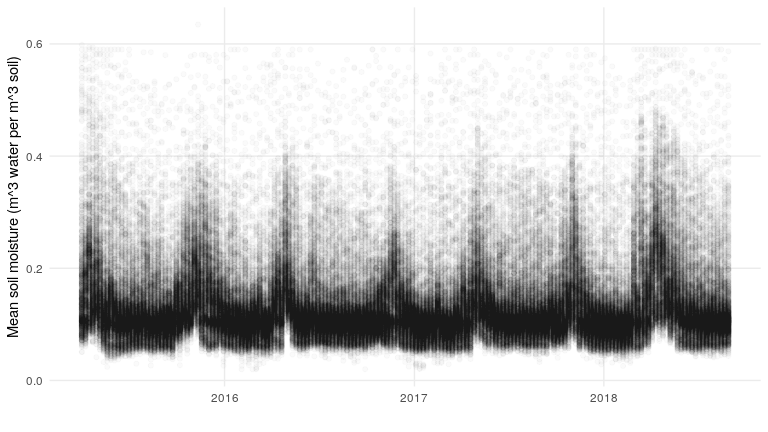 What do these data look like? What about the precipitation data? 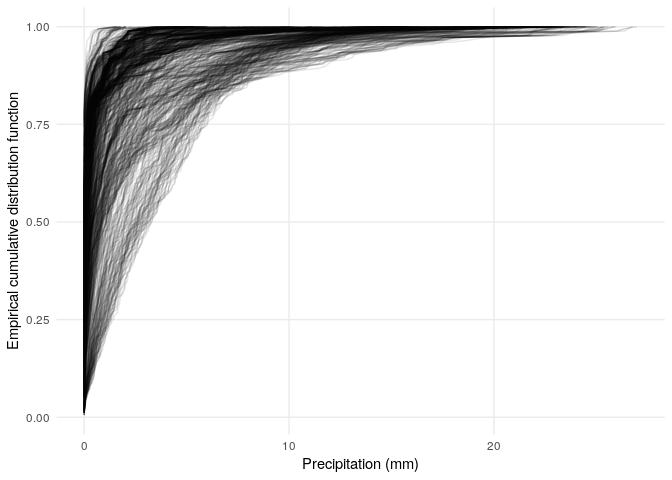 What does the relationship between precipitation and soil moisture look like? Notice the band of zero-precipitation points that sit on the y-axis. Among nonzero precipitation values, it seems like there is a nonlinear relationship between precipitation and soil moisture. So, now let’s take a look at the spring and summer of 2018, when the flooding was worst in Somalia and Kenya. 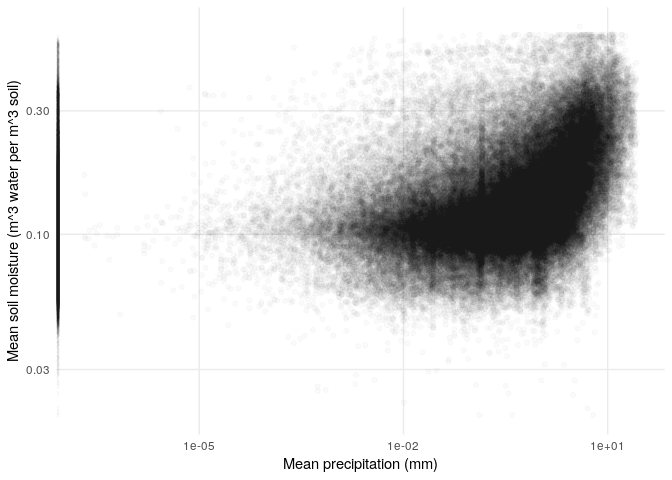 The distributions of soil moisture and precipitation are quite different (e.g., the distribution of precipitation has a lot of zero values, and a long tail). 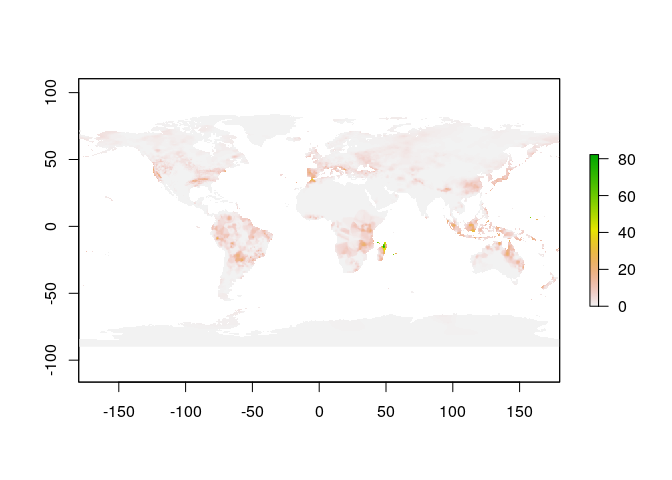 The empirical CDFs provide a mapping from the range of data to the interval from zero to one, so that we can visualize how any particular amount of soil moisture or precipitation compares to the full distribution of values for each pixel. Essentially, when the empirical CDF gives a value close to 0, that’s a low value (a small fraction of values are less than or equal to it). If the empirical CDF gives a value close to one, that’s a high value (a large fraction of values are less than or equal to it). 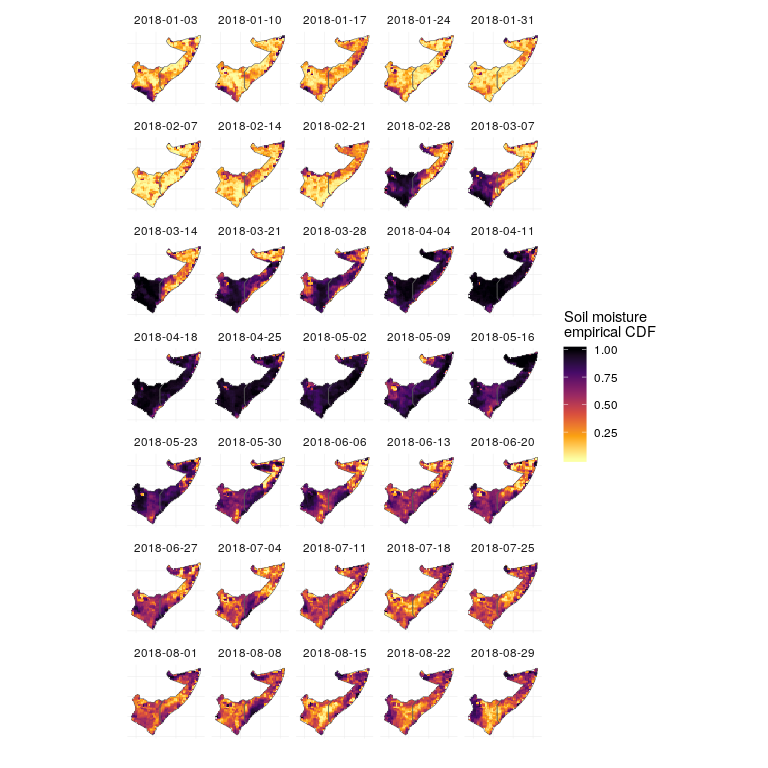 Across much of Somalia and Kenya, soils were exceptionally dry prior to March 2018 (light colors), and with the prolonged levels of high rain beginning in March, soils were much more saturated than usual through mid to late May (dark colors). The rain throughout April fell on wet soils, which are less able to absorb water, leading to overland flow and flooding. 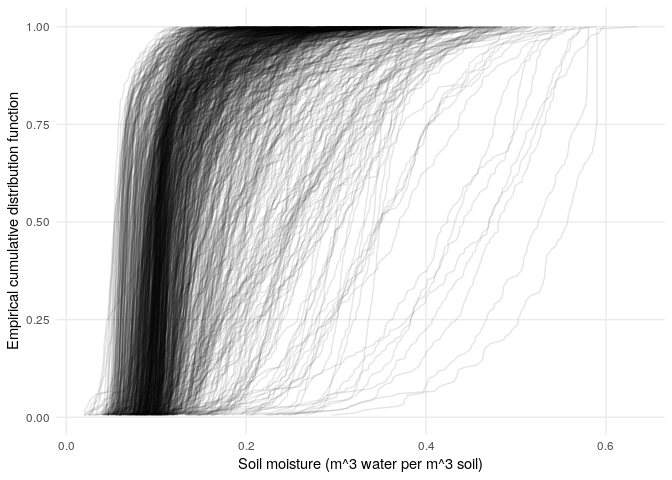 Here the soil moisture and precipitation values are mapped over time, with line plots below to show the median value (black line), interquartile range (dark grey ribbon), 10% and 90% quantiles (light grey ribbon). 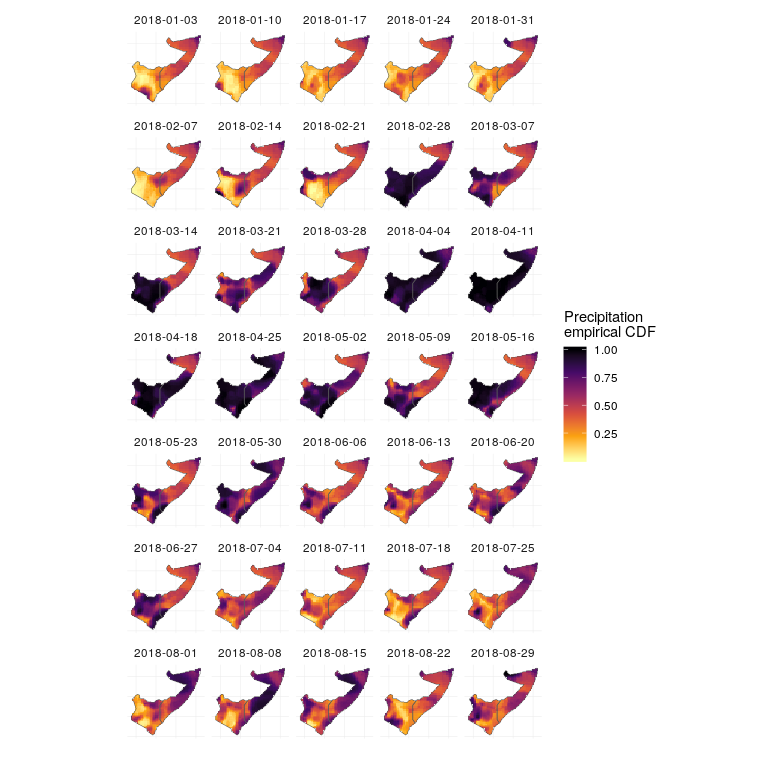 The exceptional nature of the flooding in 2018 shows up as a high and broad peak in soil moisture and precipitation, and the drought that preceded the flooding in 2017 is visible as a period of low rains and dry soil. The smapr package was developed in Earth Lab with help from Matt Oakley who worked with the Earth Lab Analytics Hub. The idea for the package emerged from a NOAA Data Partnership event in 2016, where we began working with the NASA SMAP data and realized that we had all the makings for an R package.